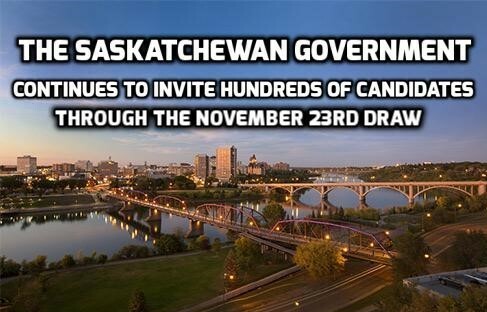 On November 23rd, Saskatchewan issued invitations to 247 candidates under the Express Entry system adopted by the Saskatchewan Government in July this year. This system operates online, where Invitations to Apply (ITAs) are issued to the highest ranked candidates in the EOI pool. Further 267 candidates were invited under the Occupations In-Demand sub-category. This category targets candidates who have previous work experience in one of the occupations that is mentioned in the in-demand occupation list devised by the Saskatchewan Government. However, the numbers of invites in this category have reduced from the previous draw conducted on November 1st, in which 671 candidates were invited. The lowest threshold in this draw showed a slight increase as compared to the previous draw held this month. This draw rose the lowest score for the Express Entry stream to 63, while the lowest score for Occupations In-Demand category now is 64. Note that all the invited candidates had an Educational Credential Assessment (ECA) before submitting their online application. A complete application must be submitted within 60 days of receiving the ITA to ensure your nomination by the Saskatchewan Government. After the introduction of the online Expression of Interest system by the Saskatchewan Immigration department, the procedure to apply to Saskatchewan has become relatively easier. Still submitting an application can be a bit more complex for some candidates. For your ease, consultants at Immigration Experts are here to guide you. Through our assistance you can now apply to Canada free of hassle. Contact Numbers: 051-8439994-7, 042-35911332, 0308,5857777. We also have our Youtube Channel to keep you updated with the immigration world.